The Ripley Wolves will add another three names to its Wall of Fame at its final home game of the regular season, on Jan. 25. 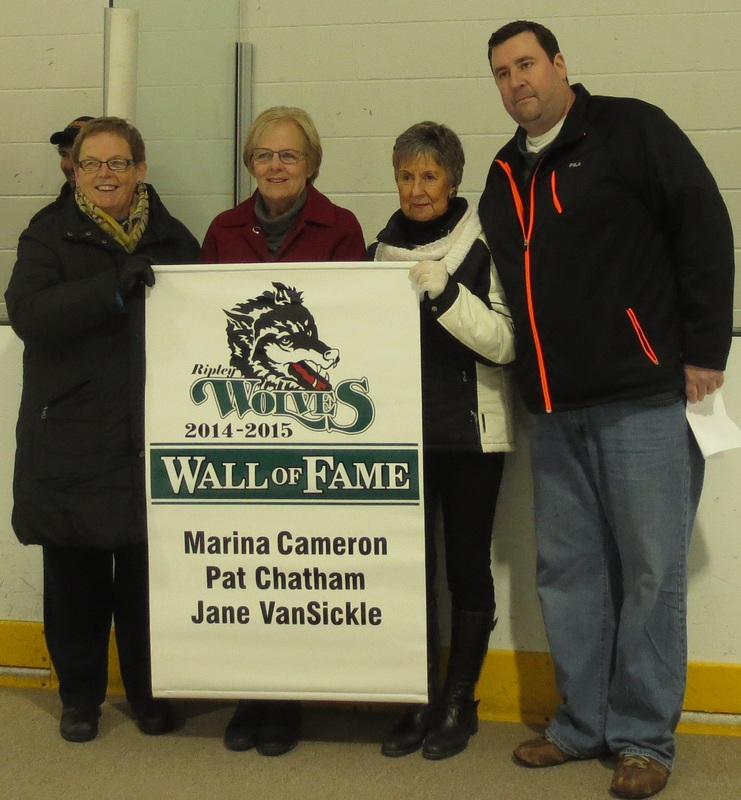 Marina Cameron, Pat Chatham and Jane VanSickle will be honoured for their years of work and dedication when the Wolves face Shallow Lake on Saturday, Jan. 24, at 7:30 p.m. Since the team returned to the WOAA Senior ‘A’ league in 2002, Pat and Marina have been the first smiling faces fans see when they enter the arena, rarely missing a game over the past decade. Working the gate is often a cold and thankless job, but Pat and Marina never miss a shift. Without their commitment, the Wolves executive would be constantly scrambling for volunteers, and we cannot thank them enough for their dedication to our hockey team. Jane VanSickle was one of the original members of the Wolves executive when the team was resurrected in ’02. Jane worked diligently to recruit sponsors, convincing them the team was back in business and loaded with local talent. After dropping out of the league after a few down years, regaining the trust of our local sponsors was a daunting task, and Jane went above and beyond behind the scenes, as the roster began to fill out. Jane also served as the Wolves’ secretary, keeping the new executive on track in its early days and helping to lay a strong foundation that the current executive still relies on today. The final home game will also be Sponsor Appreciation Night, so we invite all of our fantastic sponsors to the rink to watch what should be a showdown for top seed in the Senior ‘A’ playoffs, which will be in a round-robin format of six teams (including two from the WOAA Senior A’s South Division). The teams will play five round-robin games, with the Top 4 advancing to seven-game semi-finals beginning in March, with the winner decided in April. Currently, the Wolves sit in second in the ‘A’ pool, trailing Shallow Lake by two points with five games to play. After being snowed out last weekend, the Ripley Wolves will have two home games this weekend, as it looks to climb into top spot in the WOAA Senior ‘A’ Division. The team, which will be seeded in the bottom half of the North Division and play for the ‘A’ Division title (as opposed to ‘AA’), are just two points back of Shallow Lake for the top seed in the just-announced, six-team round-robin playoff format, which will bring two teams from the WOAA’s South Division into the fold. Each team will play five games and the Top 4 teams will advance to a seven-game semi-final series, with the winners playing for the Senior ‘A’ title in April. If the Wolves can catch Shallow Lake, they’ll have home ice advantage through the Senior A playoffs. They start on that quest this weekend when they host Shelburne at 8:30 p.m., and Saturday, Jan. 17, when Saugeen Shores comes to town for a 7:30 p.m. start. Sponsors are Parrish & Heimbecker on Friday and Pollock Electric and Royal Bank Ripley on Saturday night. Saturday is also Tyke Night so come on out and watch the stars of tomorrow between periods! The Wolves will hold their final home game on Saturday, Jan. 24, at 7:30 p.m. vs Shallow Lake. This is Wall of Fame Night, as well as Sponsor Appreciation Night. Stay tuned for more details on this year’s inductees. The make-up game in Elora will be held the Jan. 30 weekend, with the playoff round-robin starting the first weekend in February. The Ripley Wolves nearly upset the defending champions from Mapleton-Minto on Saturday night, settling for a point in an overtime loss. The Wolves were tied 2-2 after the second on goals from Cody Britton and Drew Davidson, but the 81s took the lead in the third. Brett Catto tied it with just over three minutes left in the third to send the game to overtime. Though Ripley’s goalie Jason Reid, who has resumed his Wolves career a few years after first retiring, played a great game and stopped 36 shots, the 81s scored early in the extra frame to secure the bonus point. Assists went Catto, Davidson, Tyler McCarthy and Jeremy McQuillin. The Wolves travel to Elora next Friday for an 8:30 p.m. start. They return home for two games on Jan. 16 and 17.